We know Charminar and Golconda Fort are the first things that come to your mind when we talk about Hyderabad, but have you explored these hidden gems in Hyderabad? Whether it's shopping, eating or checking out heritage spots, we're in love with these places. Amar Handicrafts in Banjara Hills is one of the oldest furniture stores to make handmade, custom furniture that makes a space all the more charming. With attention to detail, the furniture has contemporary as well as old-school designs. Think carved garden furniture and old ornate sofa frames. Although the store deals with all kinds of wood, most orders are for teakwood which is used for both furniture and carvings. We are rooting for the statement chairs and seating here, but their wood carvings (made from rosewood/teakwood) are also worth a mention because you can use these as decorative wall hangings, picture frames, and mirror frames. Sree Rama Mess (Or Raju Mess, as it's famously known) adds cool to the good old homemade food. Located in Malkajgiri, this mess is a hidden treasure of Secunderabad, and we checked it out. This 30-year-old mess was started by Raju and his mother, and no matter what hour of the day, it's always packed. The package of great food comes along with conversations as Raju can get really chatty. Politics, cinema, random conversations are served at your table, piping hot, like your rasam. The meals come with unlimited rice, dal, curry of the day, chutney, pickle along with sambar and rasam. Tucked away in the oldest lanes of Ameerpet, Amaravathi Saree House is a hidden gem with some of the best fabrics out there. We were guided to this place by a regular customer, and lo and behold, it does dye-printing too. We found a huge variety of ikat and Kalamkari which are rarely found in other stores along with beautiful Shibori print sarees and dress materials. Got a thing for Benaras dupattas? This store has lovely ones that come in offbeat colours like turquoise, tangerine, and mehendi colour. If you love books, then you will love this. Because dear LBB users, this is the Holy Grail of book places in Hyderabad. MR Book Center, a 15-year-old bookstore, offers rare, unused, and old stocks of books at super discounted prices. What defines this bookstore is its unfussy, nonchalant atmosphere. The books are arranged haphazardly, stacked in every possible corner. You need patience, we warn you, to discover books that you’ve only heard of, but never held before. Because this store is stacked high with graphic novels, vintage collectibles, Japanese manga, Reader’s Digest‘s best collections, and illustrated biographies too. You already know we've got a thing for stationery stores and SV August 15th is a fine gem in Gachibowli. This stationery and fine arts store is where both beginners and advanced artists can pick their art supplies. Touted as one of the swankiest art supply stores in Kondapur and Gachibowli, we've spotted charcoal drawing pencils, Kohinoor shading pencils, glue pens, acrylic colours, powders like sepia, graphite, charcoal at this store. Baker’s Super Mart, concealed inside the lanes of Sanath Nagar, is a baker’s paradise. From baking ingredients to tools and accessories, this hidden gem of a store has everything at great prices. Stocked up with flavouring agents, sprinkles, sugar pearls (in different colours), cake mixes, mojito syrups, cake gels, organic food colours, fondant mixes, sugar paste, glazes, and other baking additives, several home bakers and chefs of the city swear by this store. Japanese food fanatics, you can find epic ingredients like miso (a kilo is priced at INR 400), soba noodles, and plenty of other varieties. For solace amidst the silence of nature, and to meditate — head to Mahabodhi Buddha Vihara in East Marredpally. This is one of the city’s best-kept secrets and is an epitome of calmness. It has a beautiful statue of the Buddha, a garden area where you see monks doing their everyday chores, lots of open space and a library as well. The view from the top is mesmerising and will teleport you to Dharamshala in an instant. Go here for some peaceful time and activate your chakras! Neeraja's Farm Stay is plucked right out of jungle safaris and dreams. Located around 50km away from the city, if you are looking for an escape, there's nothing quite like this. Lounge in the farms of Shamirpet or settle in their common area where tables and chairs are made from wooden logs. The common seating area has a visually dynamic view of the greens, and if you are wondering if it could get any better, the bedrooms will have you stoked. Palomitas Popcorn Store is a dainty store located in Madhapur. With an Instagram-able red door leading you to the counter, find five kinds of popcorn flavours. The sweet-toothed ones can go for Caramel Crunches, Cocoa Caramel Crunches, and the Coffee Caramel Crunches. If you love spicy flavours, go for Asian Spicy Cheese and Smokey Cheese Cravings. Each of them has crunchy kernels air popped and baked to perfection, making them irresistible. 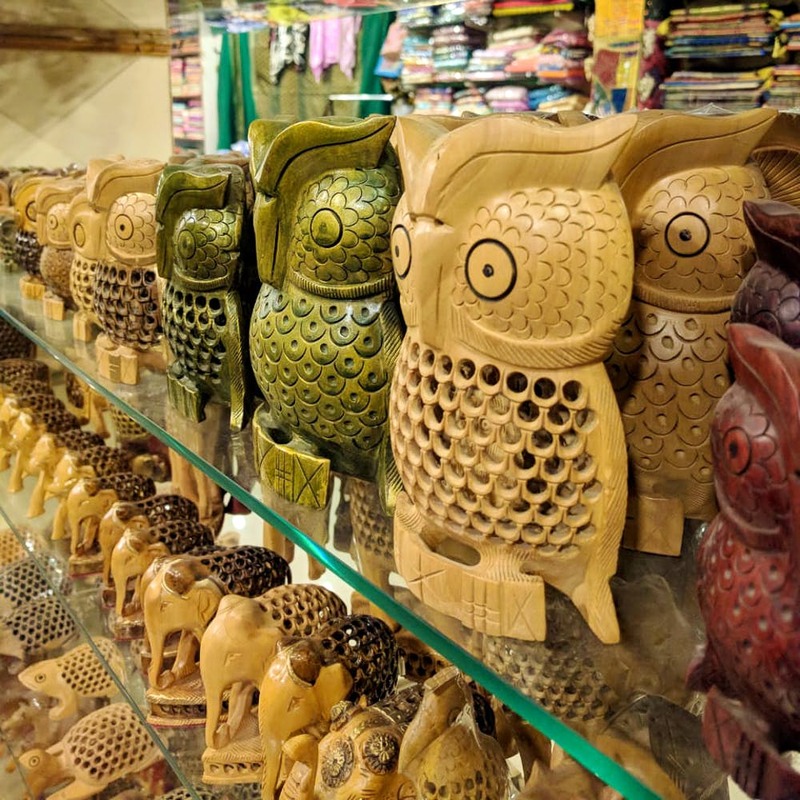 Indian Craft Gallery is for those who love to add elements of handcrafted products and rare artisan's work to their home. Although it's located at one of busiest junctions in the city, it's a hidden treasure trove. Stone studded mirrors, bright carpets in violets and maroons, Pashmina shawls, and traditional Rajasthani jewellery — Indian Craft Gallery has everything handmade, antique and old school. Exporting products from all across India, but mainly from Kashmir and Rajasthan, this store has stunning crockery, cezveh (Turkish coffee pots) that are done up in traditional Arabic and Moroccan designs, stonework, and colour block patterns.